Hearing aid technology has improved dramatically over the last few years creating new options, features and benefits. These are not your father’s hearing aids! With wireless technology, your devices can connect to your TV, iPod, and your cell phone. Wireless technology also allows your hearing aids to communicate to each other. Working together, your hearing aids make automatic adjustments that eliminate the need for you to manually adjust each device separately. Hearing aids are very inconspicuous today. With advancements in micro-technology, you don’t have to hide your hearing instruments; your hearing instruments hide themselves. We have hearing aids so small that they are actually invisible. An excuse of vanity is longer a reason to put off taking control of your hearing loss. By digitizing sound, we can use additional technologies to manipulate and refine sounds before it reaches your brain. Digital hearing aids can now: filter down background noise, separate speech from noise, eliminate buzzing and whistling, automatically adjust for music and television, and soften impulse sounds like ruffling paper or breaking glass. CROS hearing aids are specifically for people with a unilateral hearing loss, or hearing loss in one ear. Some individuals have a damaged ear on one side and are completely deaf on the other. Traditionally we would only fit the ear that is damaged with a hearing aids. Now we can put hearing aids in both ears. Using wireless technology, a CROS technology takes sounds from the side of your head with the deaf ear and send them wirelessly over to the better ear. Now it does not matter where someone sits in relation to your better ear. 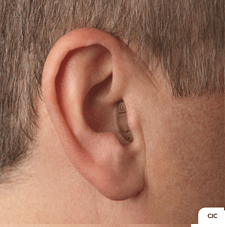 In-the-ear hearing aids sit in the shell of the ear, with all parts contained in one component. There are many different kinds of ITE hearing aids, including in-the-canal and completely-in-canal. In-the-canal and completely-in-canal hearing aids fit partly or completely in the ear canal. As the smallest hearing aids, they provide discreetness, but they may be difficult to remove for less dexterous wearers. Receiver-in-canal hearing aids are similar to BTE in appearance, but differ in that the speaker of the hearing aid is placed inside the ear canal. 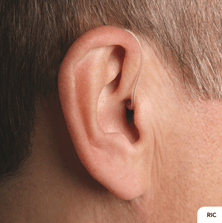 The plastic tubing in RIC hearing aids contain electrical wires. These also treat many different degrees of hearing loss. Behind-the-ear hearing aids are made of several different parts. The electronic components are housed in a component that rests behind the ear, while a thin, plastic tubing feeds sound into the ear canal. BTE hearing aids treat mild to moderate hearing loss and are discreet in style. My Hearing Centers supplies instruments from the industry’s top manufacturers. Oticon was born in 1904 in Denmark with a man who wanted his hard of hearing wife to live a life full of sound. From this simple desire, he created a hearing aid empire. To this day, Oticon produces high quality listening devises that take all the work out of hearing. Say goodbye to straining your ears, and check out Oticon’s new OPN hearing aid that gives you better hearing in noise than normal listeners. OPN uses an open sound solution to provide wearers a wider sound picture. Oticon’s BrainHearing is their groundbreaking program that reduces listening effort in every environment, giving ease in social settings. With less listening effort, you’ll have greater speech understanding, and can get back to enjoying the important things in life. Phonak has been producing high quality hearing aids for over 70 years, and continues to impress. With representatives in over 100 countries, we’re not the only ones in love with Phonak hearing aids. Their AutoSense OS technology automatically analyzes the entire sound environment, recognizes patterns, and adapts to your surroundings, all with no effort on your part. It mixes settings from multiple programs to provide optimal hearing like never before. 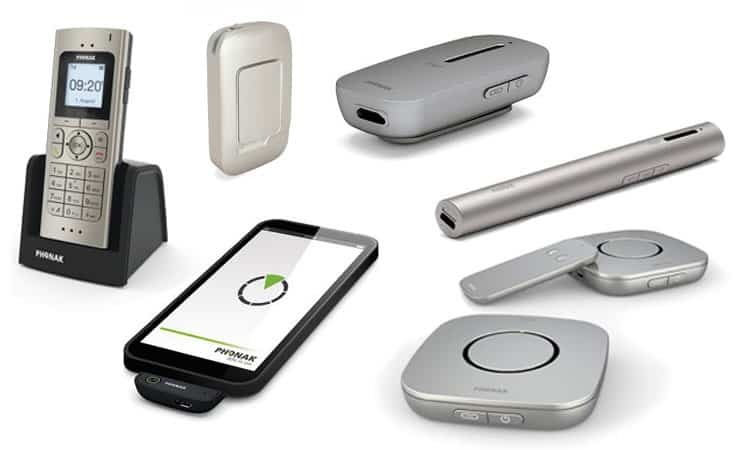 New to Phonak is the Audeo B, one of the first hearing aids to be powered by a built-in lithium-ion rechargeable battery that provides up to 24 hours of hearing on a single charge. ReSound is committed to providing clear sound through innovative technology. Founded in 1943, ReSound is a leader in connectivity and smart hearing. 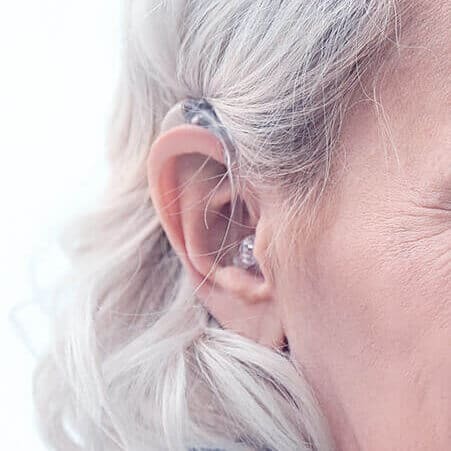 They recently released Linx2, a Made for iPhone hearing aid that’s all about connecting you to the technology you use every day. With direct streaming from your iPhone, iPad, iPod, or Apple watch, Linx2 hearing aids act as wireless head phones that allow you to connect in the same way as everyone else. This technology is fully customizable via a handy smartphone app. Siemens has been manufacturing hearing aids for more than 100 years, and continues to be a trusted name in hearing technology. Recently bought by the Sivantos group, they continue to produce high quality hearing aids under the Siemens brand. 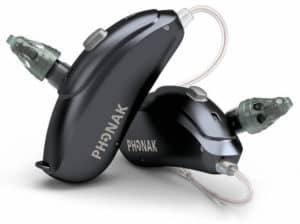 Favorite hearing aids include the binax, the first hearing aid proven to outperform normal hearing in challenging noise situations, and the Aquaris, the world’s only fully dust and waterproof hearing aid. Siemens hearing aids offer exceptional hearing in any listening environment. While Sivantos has kept the Siemens brand alive, they recently launched a new brand called Signia. Building from Siemens heritage of quality technology, Signia is committed to helping you hear better with less effort. By highlighting speech in challenging environments, and developing tinnitus relief technology, Signia’s debut model, the Primax is one of the most innovative hearing aids to date. Widex got its start in Denmark in 1956. Today it’s a leader in hearing aid manufacturing, with hearing aids in over 100 countries, and more than 4,000 employees around the world. With advances in digital technology that set them apart from the competition, they are responsible for the world’s first digital in-the-ear hearing aid that provides quality, natural sound. Their Unique series used digital technology to capture and analyze more sound than ever, giving you clear hearing like never before. Founded in 1967, Starkey is changing lives one hearing aid at a time. It all started with William F. Austin, who set out to change the world by making hearing accessible. Not only does Starkey provide you with advanced hearing solutions, they are all about giving back. For every hearing aid purchased, they donate funds to provide hearing aids for people all over the world. So far, they’ve given over 1 million hearing aids to adults and children worldwide. Starkey is continually creating new hearing aids that provide better ways to hear, like their line of digital and fully programmable invisible hearing aids that sit so far into the ear they are undetectable. If it’s connectivity you’re after, the Halo2 hearing aid features Made for iPhone technology. Starkey has even improved on nanotechnology in hearing aids, producing waterproof hearing aids that are revolutionizing where and when you can hear. Unitron is a global company that creates reliable hearing instruments. They are customer centered, and work to create hearing aids that fit the unique needs of their clients. Balancing comfort, aesthetics, and function, they strive to deliver products that are sure to please. What keeps Unitron so fresh is their new innovations like their Moxi Now. This tiny hearing device is the world’s smallest receiver-in-canal hearing aid, providing a sleek hearing aid that has all the features you need to get you through the day. It’s hearing aids like this that won Unitron a Red Dot award in 2016.